Hi! 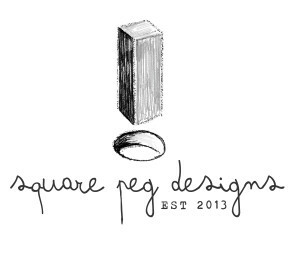 We are Square Peg Designs, a small, Niagara-based company which creates one-of-a-kind furniture and accessories with an “industrial chic” feel using vintage and reclaimed materials. Two high-school friends who decided to return to their artistic roots after over a decade of working in other fields, we see dormant beauty in items that might otherwise be destined for the landfill. We love to reuse old things in new ways, transforming them into useful and beautiful objects that are brimming with character. Everything–from old floor boards and panes of glass to mason jars and even old, used nails–has a story; we think that giving these objects a new life helps to extend that story beyond the object’s original purpose. Everything we make is hand crafted using select pieces of reclaimed wood, metal, and glass married with other vintage items and modern materials. A graduate of the Heritage Conservation Program at Willowbank, I (Mike) am able to draw on my conservation, design and craft skills to give Square Peg Designs a historically sensitive yet modern and eco-friendly sensibility. With a background in visual art and art history, my partner (Julie) lends design inspiration and is developing a complementary body of small acrylic paintings (www.julieponesseart.com). We are excited to build on our successful inaugural show at the Willowbank Stone Festival Flea (Fall 2013) and are so grateful for the support of our first patrons. If you have any comments or questions, or if you would like to inquire about purchasing one of our items or commissioning a special piece, please email us at mike@squarepegdesigns.ca. We would love to hear from you!